The main advantage of converting a PDF file into ePUB file is you can bookmark a page so that you can go to that page directly to read from the place you opened last time. In normal PDF reader software, when you open a file, it goes to first page by default. Once you download the above software to computer, you can conveniently read e-books in ePUB format even on your desktop computers. 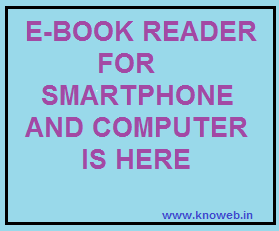 For those who love reading, this ebook reader would save them so many rupees as there are many freely downloadable ebooks on internet. The 'Adobe Digital Editions' software put your ebooks in its virtual library like you put hard books in a shelf. Enjoy the reading on-the-go !